Deal your guests a great hand with these fun Perfectly Plain playing card favors! 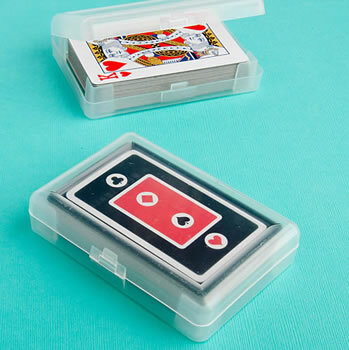 Each measures 2.5"x 3.75"x 0.75"and includes a full playing card deck inside a hard molded plastic case that opens like a book and provides a perfect place for you to apply a customized label of your choice. Label not included. Thank you so much, The order arrived in great time. Considering this was last minute order. The guest were totally happy with the Party Favors. Will definitely be ordering from here in the future. These are perfect, we past them out for a casino theme birthday party. Would highly recommend! I order these for my wedding as favors. I decided to personalize them myself and it was very easy. Ordered 100 boxes without a label and used as favors for an 80th Birthday Party which had a Casino night theme. I affixed my own label. Best DIY project I ever did !! I bought these as our wedding favors. I decided to go with the plain cards as I didn't much care for the sticker options that were available. I ended up ordering my stickers to go on the front elsewhere. I was very surprised with the quality of these cards. These cards are have a glossy finish to them rather than a papery finish that I didn't want. So I was very worried that these cards weren't going to be what I wanted. They turned out so much better than I expected and I would recommend these to any bride I know! We are using these as party favors for a gala. They are just what we needed, good quality, and excellent price. The only downside is that we plan to customize them ourselves, and it has turned out to be pretty difficult to find labels/stickers the right size to fit on the boxes. Since so many places sell the pre-printed ones, we didn't expect so much trouble. We ended up buying oval stickers which look like they will work fine. I was so surprised at the quality of the cards and the boxes. They are really well made, the cards are full size (maybe not a standard Poker deck or whatever, but great as a favor) and you can label them yourself or just let the card backs shine. These will be perfect for an event I'm having on Friday the 13th...we wanted something as a nod to the date that said "GOOD LUCK." Especially since there are a lot of small games of chance at the gala. I would recommend purchasing these. You can't beat the price, and they arrived very quickly after the purchase date. Great product, great company! I bought 100 playing cards in the case for my daughter's reception .2 came in broken. They sent replacements right away. Will be buying from them again!! We only got a few of these for certain people and I'm glad we did. The cards are of decent quality but the box is not worth anything. It wouldn't stay closed once you open them. Id highly suggest securing the cards a different way and just pitching the case all together.